A once in a life time opportunity is being presented by Pasadena-based Brokerage firm SDA, representing ownership, to acquire the new Rite Aid in Glendale, California, currently under construction. 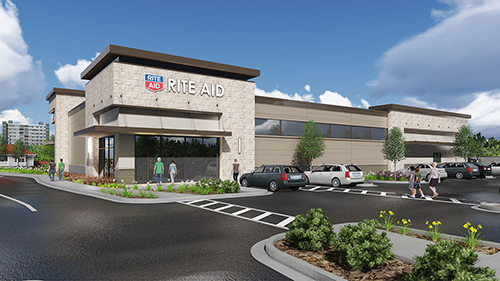 Rite Aid has had a long standing presence in Glendale, and with this new location it will be serving its loyal customers filling a void in the north western quadrant of Glendale. The irreplaceable signalized corner with freeway visibility, attractive new prototype and a Rite-Aid corporate guarantee are powerful ingredients that elevate this property to a trophy NNN asset. “When HRI Development, an affiliate of SDA, approached us last year with the opportunity to acquire and develop this site in a joint effort, we were excited to own and develop on such a rare site within Glendale with over an acre of land, on a busy intersection, and freeway visibility. With the execution of the Rite Aid lease in hand, our team went to work quickly to work with the city to bring a beautifully designed and high profile development to an important corner lot that had been neglected for several years. We are very pleased with how it has turned out” says Evan Farahnik, a principal at the Beverly Hills-based Starpoint Commercial Properties, who is leading the charge on this project. The new Rite Aid is located at 707 N Pacific Avenue at the former site of Marie Callender’s restaurant, which closed in 2012. Since then, there have been many attempts to re-develop the site but all met with challenges including high land value, traffic concerns and methodical and careful scrutiny of planning staff at the City of Glendale. “Glendale is my home town,” says Ara H. Rostamian, a Vice President of Retail Investment Group at SDA, who facilitated the site acquisition. “It was a monumental task to satisfy all parties involved with the acquisition, but we made it happen with everyone’s tireless commitment. I look forward to identifying the best candidate to acquire this trophy property. Inventory for new single-tenant net-leased product is low. With such high barriers to entry, we seldom see new product with a 20 year lease term become available in infill areas such as Glendale”, says Rostamian. The parcel is approximately 50,000 square feet, located at the NWC of 134 freeway and Pacific Avenue, with visibility at the on-off ramp to the freeway. “We were carefully tracking suitable opportunities for Rite Aid from the time they closed the Brand location” says Lelen Sarkisian, Executive Vice President at SDA, who approached Rite Aid with the opportunity. “This location will be a winner for Rite Aid” she says with confidence. The Glendale Rite Aid will be the first freestanding newly constructed drug store to be available for sale in the San Fernando Valley since 2011 according to public records. The new store is approximately 12,900 square feet with a 1,100 square feet mezzanine and is being offered at $15,875,000. For additional information you may contact Ara Rostamian at SDA, at (626) 538-3057.